One of the long-running storylines which took place during the Attitude Era was the The Brothers of Destruction saga. The Undertaker was involved in a feud with his former managerPaul Bearer. During the course of their rivalry. Paul Bearer threatened The Undertaker with revealing his 'secret'. Bearer called him a murderer and accused him of killing his real parents and half brother. He then revealed that his half brother Kane was actually still alive, warning him that "your brother Kane is coming!". After weeks of hype, Kane finally debuted at Badd Blood: In Your House, wearing a mask to hide his storyline burned face, during the hell in a cell match between Undertaker and Shawn Michaels. Kane famously ripped the door off its hinges before delivering a tombstone to The Undertaker. At first, The Undertaker refused to fight him. However he finally agreed to fight Kane at WrestleMania 14, after Kane cost him his WWF championship match against Shawn Michaels at the 1998 Royal Rumble, before locking him in a casket and setting it ablaze. The Undertaker won the match but their feud continued and also included the first ever inferno match in WWE, at Unforgiven 1998 in which The Undertaker was again victorious. The brothers would also go on to feud with both Stone Cold Steve Austin and Mankind during this period and it was ultimately revealed that they had begun working together, uniting to form the team that became known as The Brothers of Destruction. They would continue to go back and forth between teaming together and feuding against one another throughout the remainder of the Attitude Era. In late 1998, The Undertaker turned heel after Paul Bearer betrayed Kane and realigned with him. The Undertaker began taking a more satanic and darker persona claiming that a "plague of evil" would hit the WWF. During the weeks that followed he feuded with Steve Austin whom he blamed for costing him the WWF Title and began talking about his Ministry of Darkness. The feud saw some of The Undertaker's most defining acts of the Attitude era like kidnapping Stone Cold and attempting to embalm him alive, and most famously crucifying Steve Austin on The Undertaker's symbol. At Rock Bottom 1998, Stone Cold Steve Austin buried The Undertaker alive causing him to disappear for a month. A month later, A much scarier, darker, druid like Undertaker returned to television and introduced his ministry of darkness and along with The Acolytes (Farooq and Bradshaw) began recruiting wrestlers like Mideon, Viscera and The Brood (Edge, Christian, Gangrel) in the Ministry. Over the weeks that followed The Undertaker announced his intentions of taking over the WWF and claimed he was working for a higher power. He began playing mind games with then recently turned face Vince McMahon and his daughter Stephanie McMahonWith the Ministry burning Undertaker's symbol in the McMahon family yard and Hanging the Big Bossman at WrestleMania 15. After finally kidnapping Stephanie McMahon atBacklash: In Your House, He attempted to marry her on Raw in a Dark wedding until she was saved by Steve Austin who helped his enemy Vince McMahon to fight the Ministry. In a turn of events Shane McMahon turned on his father Vince and took control of the Corporation to take control of the WWF along with the Undertaker forming the Corporate Ministry. The following two months was a battle between the Corporate Ministry and Vince McMahon, The Rock and Stone Cold Steve Austin. The Higher Power on was later revealed to be Vince McMahon who was the mastermind behind the Ministry of Darkness revealing that he and Shane had used their family to fool everybody and gain revenge on Steve Austin. The Corporate Ministry lasted until Fully Loaded (1999). 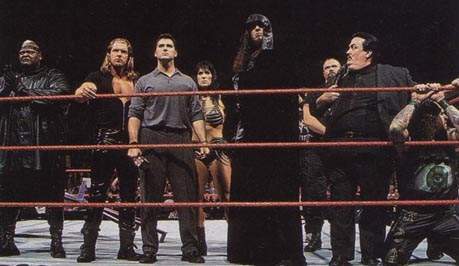 After this, The Undertaker began a tag team with the Big Show and was still associated with the left over members of the Ministry, until Undertaker received a groin injury, disbanding the group.